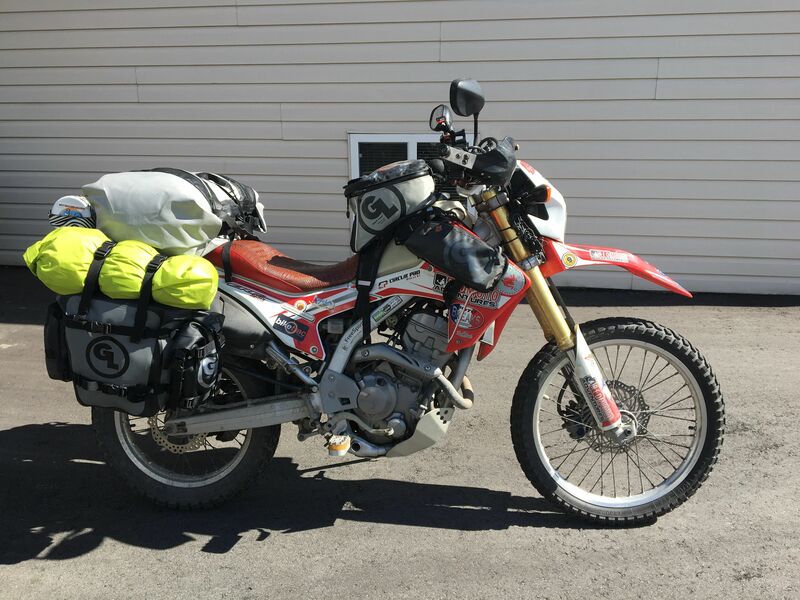 At Giant Loop Moto we are constantly getting asked all kinds of great questions on luggage set ups and how to pick the right gear. Everyone eventually develops their own personal packing system and camping style, but until then it’s hard to know where to start. You have to ask yourself, what is my ultimate goal? Am I going to be a day tripper? A weekend warrior? A long distance traveller? Live on the bike? Will I always be camping or find hotels along the way? Some of you will do both day missions and longer trips and you’ll need different set ups for each application —no one needs a Great Basin Saddlebag for a day trip (unless it’s to the grocery store), nor do you want to be deciding whether or not you can cram in that pair of flip flops for the week long mission exploring the Oregon coast (trust us, don’t be a hero, take the flip flops) Even further, you may have more than one motorcycle (you’re one of those aren’t you?) which each require completely different systems. 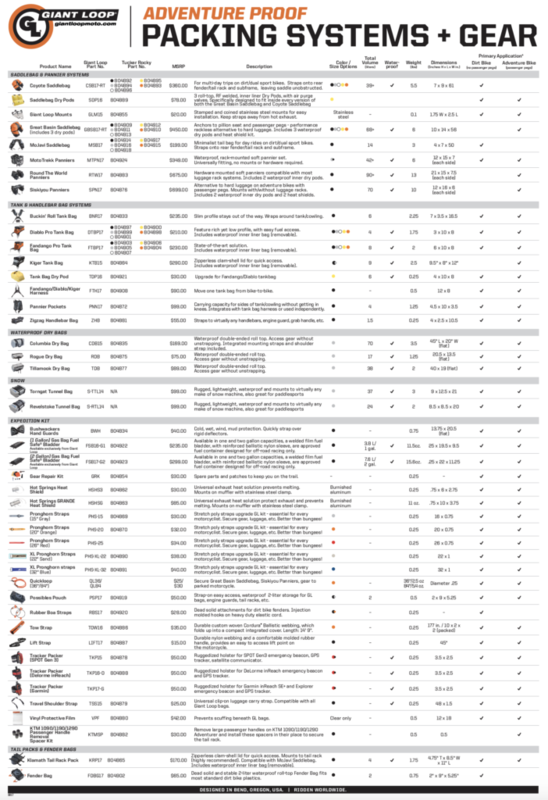 We have developed some handy tools to give you an overview of all Giant Loop has to offer. 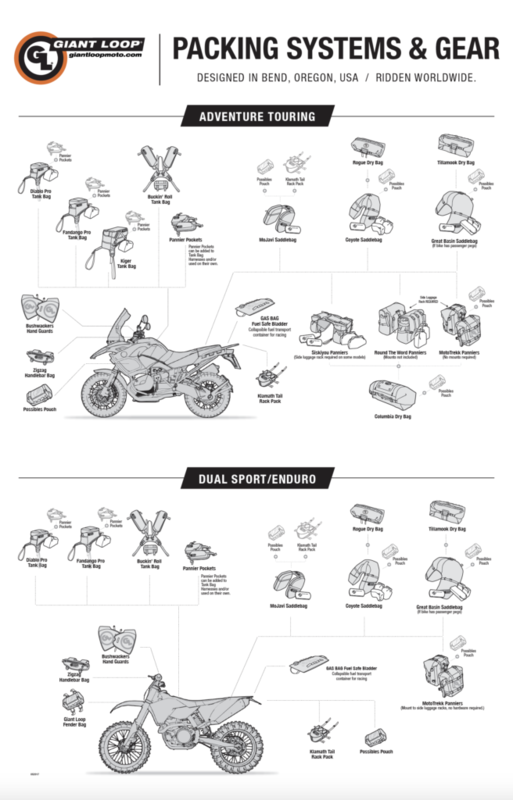 One is a Giant Loop Product Chart with sizes, capacities and weights and the second a packing systems diagram to illustrate how our products fit on dual-sport, enduro and adventure touring set ups – both courtesy of the uber-talented Moser Graphics. And, if you still have questions check out our array of blog posts on fitment for all kinds on motorcycles or contact us though our website, and Facebook page! Go light. Go fast. Go Far!